The Europe heparin market is a consolidated arena, with Pfizer, Aspen, Sanofi, and Leo Pharma commanding 65.5% of the overall market in 2015. Transparency Market Research (TMR) observes in a new study that Sanofi alone accounted for a whopping 47.5% share in the same year, becoming the frontrunner in the market. “Market leaders are paying high attention to in-licensing and acquisitions, expansion of research and development activities, and portfolio diversification to strengthen their position,” says TMR’s lead analyst. Companies are likely to tap developing countries to maximize their profit in the market. 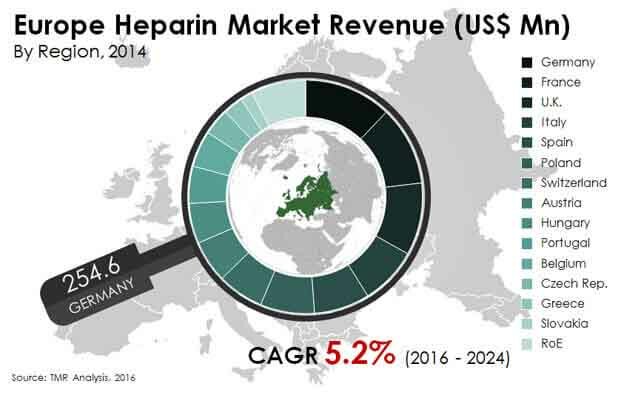 The valuation of the heparin market in Europe was US$2.32 bn in 2016 and is expected to rise to US$3.49 bn by 2024, progressing at a CAGR of 5.2% between 2016 and 2024. On the basis of product, low molecular weight heparin (LMWH) will continue to dominate the market until 2024, representing 83.6% of the overall market value. The demand for LMWH is estimated to remain high over the coming years owing to its increasing usage during surgeries and in the treatment of coagulation disorders. The segment is anticipated to expand at a CAGR higher than any other segment during the review period. Country-wise, Germany will continue to be the leading revenue contributor until 2024. The widening base of aged population and rising prevalence of pulmonary embolism are contributing to the growth of the country. In Europe, Germany, France, Belgium, and Portugal will be the sights of high growth rate – all posting a CAGR of 5.5% during the same period. The number of deaths caused by venous thromboembolism (VTE), a type of coagulation disorder, is more than deaths due to AIDS, breast and prostate cancers, and highway accidents put together. The high incidence of coagulation and renal disorders is creating an alarming situation, which in turn is encouraging the development of heparin market in the region. The increasing inclination of slaughterhouse owners to venture into the heparin processing business is bridging the demand-supply gap and also reducing the overall cost of finished goods, which in turn is also working in favor of the market. Moreover, the ban on imports from China is leading to a shift in the production of heparin from the East to Europe. “The event of recall of heparin products imported from China in 2008 due to the presence of allergenic substances in high volumes has turned out to be positive for the Europe market,” says a TMR analyst. The availability of alternative anticoagulants such as coumarins, warfarin, and oral anticoagulants is negatively impacting the growth of the market. This is exacerbated by the introduction of new anticoagulants such as rivaroxaban, dabigatran, and apixaban. “The risk of infection and contamination associated with heparin owing to the fact that it derived from animals is prompting consumers to drift towards anticoagulants,” says the author of the report. Furthermore, the patent expiration of some blockbuster brands along with the mounting use of off-label products is hampering the growth of the market.